1.Preheat oven to 350°. Spray 13 x 9-inch glass or ceramic baking dish with nonstick cooking spray. Place bread on 2 rimmed baking pans and bake 15 to 20 minutes or until bread is lightly crisped; let cool. Transfer bread to large bowl. 2.In large skillet, melt butter over medium-high heat. Add celery and onion and cook 6 to 8 minutes or until vegetables are tender, stirring occasionally. 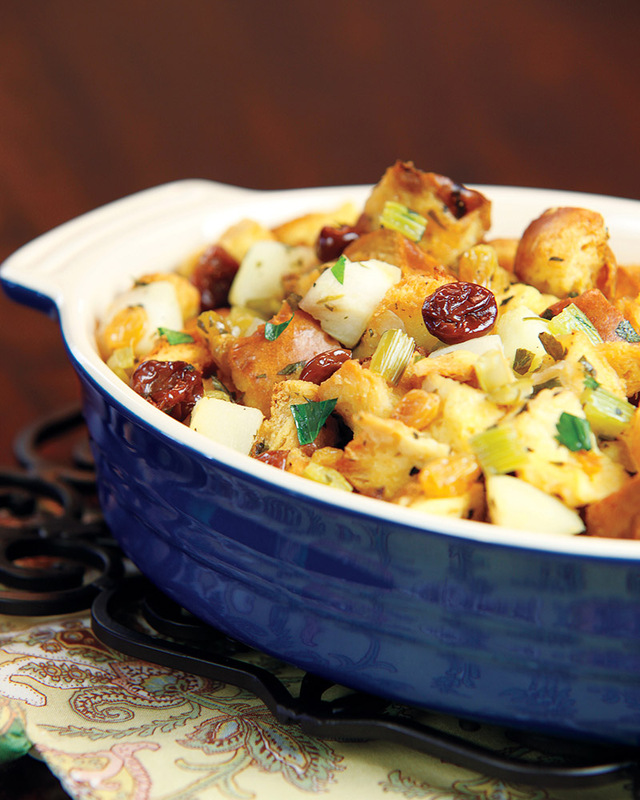 Stir in apples, parsley, thyme, nutmeg and pepper, and cook 4 to 5 minutes or until apples are crisp-tender, stirring occasionally; fold in cherries and raisins. Add broth and heat to simmering over medium heat; remove from heat. 3.In small bowl, whisk eggs. Pour hot broth mixture over bread and toss until combined. Add eggs and gently toss until combined. Transfer bread mixture to prepared baking dish; cover tightly with aluminum foil. Bake 30 minutes. Uncover and bake 15 to 20 minutes longer or until top is lightly browned. If you don’t have sourdough bread, you can substitute a whole grain or multi-grain loaf of bakery bread. Also you could use other seasonal fruits such as pears, figs and persimmons!